Great for beginners or those guitarists that don't need a ton of memory slots or recording length. Here we’re looking at Electro Harmonix’ 720 stereo looper pedal. Basically, Electro Harmonix is a massive brand in the guitar gear industry, and 720 is one of their (although not so recent) latest editions out there. It’s widely proclaimed as one of, perhaps not the best, but finest stripped-down compact pedals in the looper section due to its exceptional audio quality, great versatility, and remarkably simple operation. Be sure to check out the other picks in our Best Looper Pedal Buying Guide. In a nutshell, Electro Harmonix 720 looper features a relatively compact casing, although it’s strikingly bigger than average, so players with multiple pedals in their rig should prepare to do some prioritizing. It’s excellent for studio work since in this setting you don’t actually need to worry about space in that respect. There’s a total of 12-minute loop time, an unlimited amount of overdubbing, completely stereo operation, the ability to loop two instruments simultaneously, a foot switchable undo/redo options, dual footswitches, and reverse & ½ time settings. The first feature is the (volume) ‘level’ found on the top right corner of the 720 stereo looper. Right next is the ‘push: mode’ which allows you to select the number of repetitions, and just after is the LCD display of the selected loop mode. There are two buttons below the aforementioned controls named ‘reverse’ and ‘1/2 speed’, both of which are fairly self-explanatory. The reason why this looper pedal is so good for acoustic guitars is because it offers a little more flexibility in terms of sound. The total loop time is also amazing, as well as the ‘half-speed’ feature which not many pedals boast. It’s big, and given that most acoustic players don’t use a lot of pedals by default, this makes it practically suitable for this particular occasion more than any other given scenario – the big footprint, however, makes it hard to fit into a regular pedal rig. On another note, Electro Harmonix is a very, very popular brand, and it goes without saying that their pedals use some of the most advanced, bleeding edge technologies, so you should expect a lot from the 720 as far as audio quality goes. In terms of durability, the big casing is clearly built to withstand quite some punishment before kicking the bucket. Like we’ve already mentioned, you should take into account that this pedal has a big footprint. This is, however, not the only downfall. Namely, it has several features and controls onboard, making it a bit ‘harder’ to use in a sense for beginner guitarists. Consider it if you intend to plug it in your (semi) acoustic guitar and if you’ve had some prior experience with loop pedals. Overall, it does the job for the money and then some, packing a huge value for the buck due to great versatility and superb audio quality in general. 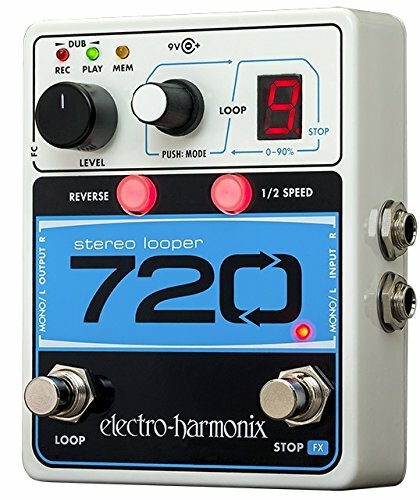 All things taken into account, Electro Harmonix’ 720 stereo looper pedal holds a massive value for the money, and then some.